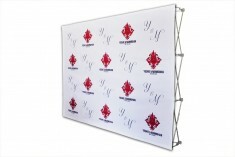 Perfect for a Photo Booth or Press Conference! 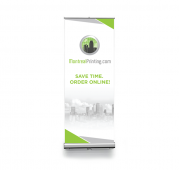 Eye Catching flags for your company or event! Get Noticed with a Beach Flag! 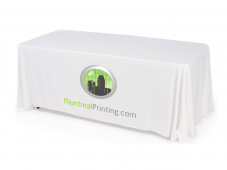 Montreal Printing offers a wide array of banner displays, flags and tradeshow displays. 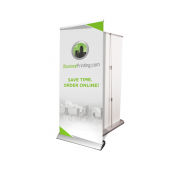 Whether you need a single retratctable banner stand or need to fill a 20 foot booth space, we've got you covered! 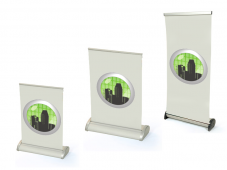 Self Standing Banner Displays are perfect for retail applications, add-ons for trade show displays or as a quick backdrop for sales presentations. 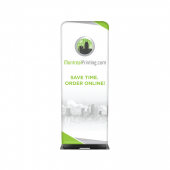 Self-retracting banner displays open and close in seconds and are extremely lightweight and can be brought anywhere. Feather and blade flags are great for getting attention to your store or event - these displays move in the wind and are a real eye-catcher. Portable Backdrops are the perfect solution for events and press conferences - the fabric provides a glare-free background ideal for pictures or filming. Pop up fabric displays are the ultimate in mobile trade show displays. They offer a full-color seamless graphic in a lightweight easy to asssemble package. Our printing is absolutely as good as it gets; with our 8 color UV inks and state of the art large format printers - the colors are brilliant and photos are crisp! The best part is our easy online ordering and file uploading website, giving you the information you need immediately and the capability to order easily and without hassles.